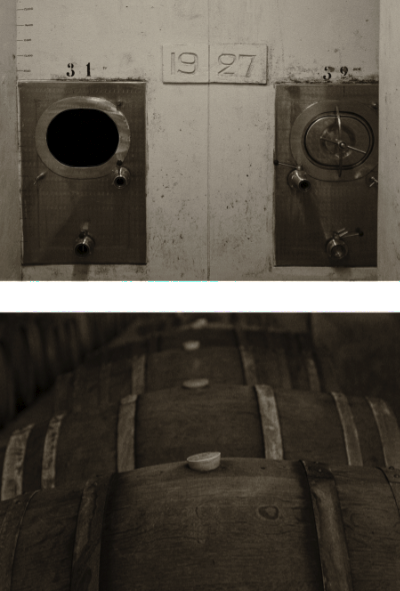 Koopmanskloof is set in the Bottelary Hills in Stellenbosch, with a wine tradition dating back more than 200 years. "Koopman" is the Dutch word for Trader and "Kloof" is a Ravine, thus the direct translation is "Trader's Ravine". History has it that at the time of the arrival of the first European Settlers at the Cape of Good Hope, many of the indigenous communities were unfriendly toward the Settlers. The Koopmanskloof community however were described as fair and friendly traders. The name therefore not only defines the location but also the profession and character of this community. 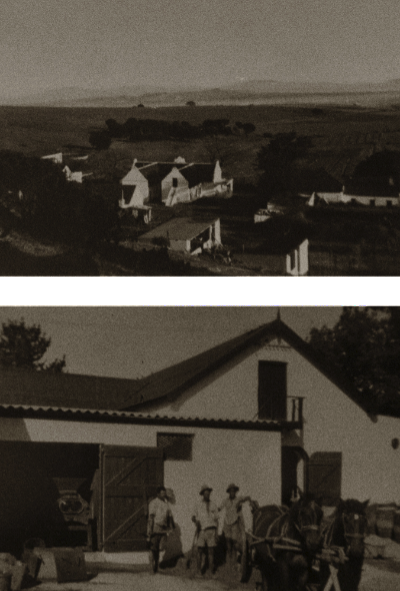 Koopmanskloof has been in the hands of the Smit family since 1895. 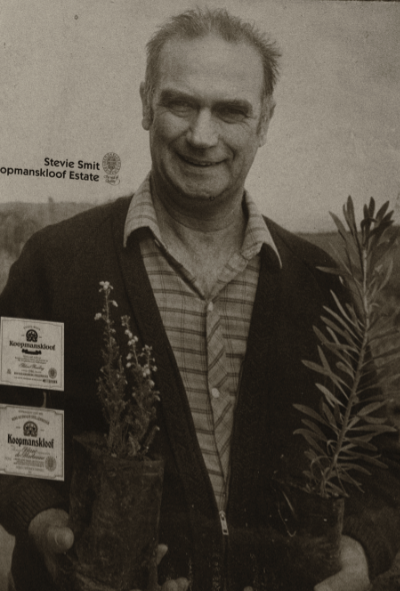 The late Stevie Smit bought the farm from his father and the farm was expanded and owned by him until his recent demise at the age 82. The farm is currently owned by the WS Smit Family Trust, with production and marketing operations firmly in the hands of Koopmanskloof Wingerde (PTY) Ltd.
Oom Stevie was very passionate about the preservation of our natural vegetation and therefore in 1980 requested the proclamation of a Private Nature Reserve on the 98ha fynbos which was set aside for the preservation of the endangered types of vegetation present on his farm. The Dutch Governor Simon van der Stel founded Stellenbosch in 1679 and later allocated farms in the Bottelary region. The name "Bottelary" probably stems from the Dutch word "bottelarij" meaning 'pantry' or 'store room'. In earlier days trh area provided fresh supplies to ships and settlers of the Cape. The first vines where planted during the early 1700's as the mild Mediterranean climate is ideally suited to the production of quality grapes. Growers soon realized the potential of the fertile soils against the slopes of the hills and as the wine industry grew so did the area under vines. Today numerous internationally renowned wine estates lie amongst these hills. The Western Cape is a province in the south west of South Africa. The capital is Cape Town. Prior to 1994, the region that now forms the Western Cape was part of the huge (and now defunct) Cape Province. Prior to the formation of the Union of South Africa in 1910, it was called the Cape Colony. The Western Cape is exceptionally topographically diverse. Most of the province falls within the Cape Fold Belt, a range of sandstone folded mountains of Permian to Carboniferous age that range in height from 1000m to 2300m. The valleys between ranges are generally very fertile and contains alluvial loamy to clay soils. Coastal areas range from sandy between capes, to rocky to steep and mountainous in places. The Western Cape is also the southernmost region of the African continent with Cape Agulhas as its southernmost point, only 3800 km from the Antarctic coastline. The total land area is 129 370 km², about 10.6% of the country's total. It is roughly the size of England or the US state of Louisiana. Vegetation is also extremely diverse, with one of the world's seven floral kingdoms almost exclusively endemic to the province, namely the Cape Floral Kingdom, most of which is covered by Fynbos ('fine bush'). It is extremely rich in species diversity, with more plant species occurring on Table Mountain than the entire United Kingdom. It is characterised by various types of shrubs, thousands of flowering plant species and some small trees. The Republic of South Africa is the country at the southern tip of Africa. It borders the Atlantic and Indian oceans and Namibia, Botswana, Zimbabwe, Mozambique, Swaziland, and Lesotho, an independent enclave surrounded by South African territory. South Africa is a member of the Commonwealth of Nations. The South African economy is the largest in Africa and 24th largest in the world. Due to this it is the most socially, economically and infrastructurally developed country on the continent. South Africa has experienced a different history from other nations in Africa because of early immigration from Europe and the strategic importance of the Cape Sea Route. European immigration began shortly after the Dutch East India Company founded a station at what would become Cape Town, in 1652. The closure of the Suez Canal during the Six-Day War exemplified its significance to East-West trade. The country's relatively developed infrastructure made its mineral wealth available and important to Western interests, particularly throughout the late nineteenth century and, with international competition and rivalry, during the Cold War. South Africa is ethnically diverse, with the largest Caucasian, Indian, and racially mixed communities in Africa. Black South Africans, who speak nine officially recognised languages, and many more dialects, account for slightly less than 80% of the population. Racial strife between the white minority and the black majority has played a large part in South Africa's history and politics, culminating in apartheid, which was instituted in 1948 by the National Party (although segregation existed before that time). The laws that defined apartheid began to be repealed or abolished by the National Party in 1990, after a long and sometimes violent struggle (including economic sanctions from the international community) by the Black majority as well as many White, Coloured and Indian South Africans. Several philosophies and ideologies have developed in South Africa, including ubuntu (the belief in a universal bond of sharing that connects all humanity) and Jan Smuts' holism.